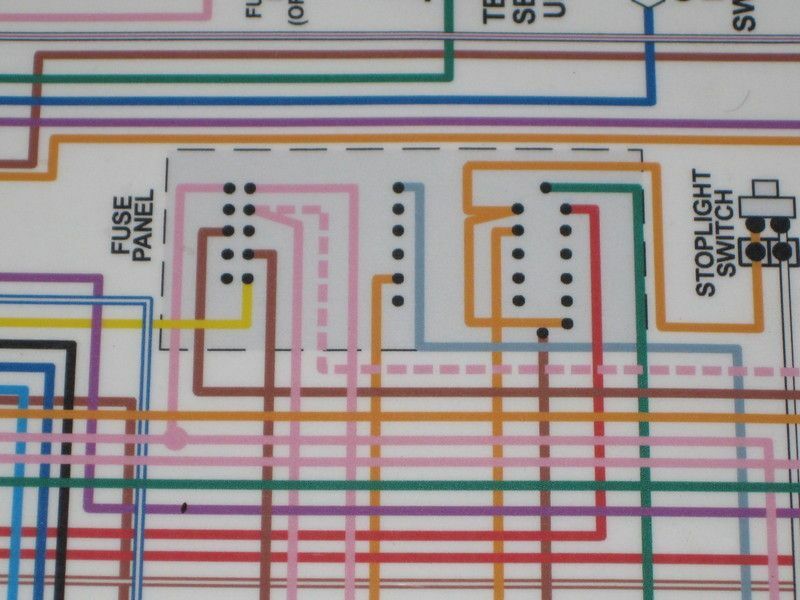 I've got a nice color wiring diagram for my '68 Camaro and can figure out a lot, but every time a wire runs into the fuse panel I'm completely lost because I can't figure out what's connected to what in the fuse panel. Any ideas how I can make sense of this? Your color diagram is useless for the fuse panel as it is.....You need to compliment it with a real schematic that is in the AIM manuals or the electric wiring manual. You can always take the fuse panel out (without disconnecting or cutting wires) and easily make your own schematic of the panel. Disconnect battery first. I checked out the AIM before posting, and didn't find any detail on the inner connections for the fuse panel. Do you know where in the AIM such a schematic is? For 1968, I only have a chassis manual, but the schematics are mostly the same. Page 12-77 of the chassis service manual has the fuse panel wiring. Like I said, you may have to take the fuse panel out if you want to see how it is fed. I suppose you are looking for the 12+ feeds? They are staggered, one feed for 12+ batt and one feed for 12+ ign on. Also if you tell me what you're trying to do or find I can prob help quicker. the wiring diagrams that Larry did have a close up of the fuse panel. There's really not much in there though, most of the wires pass clean thru. New website for my vert is coming together. Do ya like the slide show on the home page? Greg: Thanks for the reference. I guess I'm just a dumba**. I looked at page 12-77 and see wires going into the fuse block, but can't tell where they go from there. I think you're right, the only way to really tell is to take a multimeter to the fuse block itself. Happily, on further thought I'm not sure I need to chase this down. I'm wiring the car with the Isis system - consisting of a master cell that receives input from switches and in turn tells one or more remote power cells to send power to the item meant to be turned on by the switch - and thought I needed to replicate the factory wiring. Now that I've done some more reading and have thought about it a bit, I think I can simplify the wiring enormously using the capabilities of the new system. JimM - I'm not sure which Larry you're referring to or where his diagrams are. No worries. That is quite a system, multiplexing the electronics/lights etc together. One of the nice things about the Isis system is that you have very little amperage under the dash or anywhere else other than the relatively short runs from the power cell to the item to be powered. All of the master cell inputs are made by completing a circuit to ground, and that circuit carries milliamps. The system as a whole is fused, and the individual outputs from the power cells are fused as well. But between the Isis system, the electronics for the LS3, wiring the guages and the Navigation/audio/blue-tooth system I'm sticking in this thing, it may be months before I pick up a wrench again. I believe the Isis system is unique, but has been used by the upper auto manf's for a few years, or a system simuliar to it, may not be the Isis brand name, but same concept. I think its intention is to replace the heavy current load through switches and pawn it off onto relays, or the slave units. I think I would keep the headlight system as designed until a confidence factor was built before giving up complete control to the Isis system. I understand your thinking, but how do I choose headlights over power to the ECU, or the fuel pump, or brakelights? It seems to me you either trust the technology or you don't; you know what they say "fools rush in . . . "
Mike, be sure and take some install pix when you start the ISIS system. I also bought the system when they had the first GP last year and probably won't be installing it until this fall. I am also going the same route (LS3) and installing everything all at once. I am (sort of) documenting the build, and will definitely detail what I do with the ISIS system install. We've had what passes for "winter" weather here (SoCal) for the last few days, so I've been inside trying to determine my switch, master cell and power cell scheme. The only thing that looks like it may not be possible with the factory light switch is gauge light dimming. I can either run 12V to the factory switch and then out to the gauges (a pretty short run), or use a separate center tap potentiometer and use the Isis system for light dimming. The ignition switch is substantially simplified, as all you really need from it is starter and ignition power. I'm considering doing away with the key ignition entirely and using the Isis pushbutton start feature, but will probably use an additional kill switch somewhere in the car. They claim that we'll be able to use their website to configure and then download programming for the power and master cells. I hope so, as that would make my life easier. I got the 3 cell kit and want to use the third cell in the cabin to do things like power the turn signal indicators, high beam indicator and the like, rather than running wiring from the front power cell back into the cabin.